As everyone knows, if a company want to stand out from its peers, there are so many factors in it, including marketing, advertising and branding, so what’s the difference among them? Marketing is the image that you are trying to present to others. It starts with how you dress, the colors and patterns you choose, and how you groom. We all have a strategy for this–yes, everyone, including your unkempt second cousin who rarely showers and wears the same Star Wars shirt he’s worn since college. Even not having a strategy for your personal appearance is a strategy itself. You choose your image to portray yourself as a business professional, a punk rocker, a tech nerd, etc., and by doing so, you are expressing to others through your appearance your character, lovable attributes, and in the end, the value you offer to others. If marketing is how you see yourself, advertising describes your actions. How you carry yourself, where you hang out, and what you say are just as important as how you look. All of this should be considered with your marketing strategy to assure that you have consistency between your image and your actions. For instance, imagine that you wear a New England Patriots jersey and get a “I Heart Tom Brady” tattoo, but during the Super Bowl, you cheer for the Philadelphia Eagles and celebrate their victory. You will confound–and probably infuriate–all of your friends and likely be exiled from future Sunday game days. While marketing is how you want others to see you, branding is how they actually do. 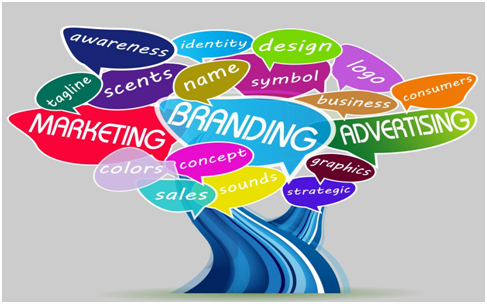 Your marketing strategy should assess and consider your personal brand. If you have a strong brand, you can spend more time building on it. If you have reputation problems, however, you need to focus on rebuilding or changing perceptions. As an example, if your professional network believes you to be a fraud or slacker, then it will require more than just dressing professionally and mastering your LinkedIn profile to change this perception. Similarly, from a business standpoint, understanding how consumers perceive your business is crucial for how you decide to execute a marketing and advertising strategy. Now, after the explain about marketing, advertising and branding, I hope you can have a more clearing understanding about them.